But that only indicates lack of awareness. Innovation, today, is the buzzword in the world of information technology. And India is very much in the race for recognition and reward, as dozens of young entrepreneurs display feisty determination and unleash a range of world-class innovative products and services. The National Association of Software and Services Companies -- the apex body of IT firms in India -- recently paid tribute to the spirit of innovation shown by emerging companies in the Indian IT industry. Of the 96 initial participants, six were finally chosen by NASSCOM as the best innovators: Beehive Solutions, Compulink Systems, Liqwid Krysal India, PACE Soft Silicon, Srishti Software, and Whizlabs Software. rediff.com brings to -- in a new series beginning today -- the story of the success of these and other innovative companies, the problems faced by young entrepreneurs, their never-say-die spirit, their determination and diligence to create a winner, and the pain and the ecstasy behind their final triumph. When IITians -- that hallowed breed -- graduate, conventional wisdom has it that they either go abroad to pursue further studies and make pots of money, or they go into management courses so that they can -- you guessed it -- make pots of money. Yet, the trio -- all first generation entrepreneurs and sons of government servants -- braved the lesser-know road and came up with Whizlabs Software, an IT firm, and began tinkering with ideas and projects. 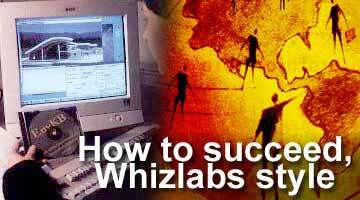 Whizlabs is an emerging company aiming to be a global player in providing eLearning solutions. Its focus is on IT certification exam preparation for individuals and IT skill assessment and enhancement for corporates. Soon, success followed as their ideas found a market, so much so that NASSCOM selected them for its IT Innovation in India: Showcasing the Emerging Companies, an event held across Delhi, Mumbai and Bangalore. For these young men, it was a chance to show the larger world their ticket to stardom: preparing online for IT certification exams. Later, Chopra and Nakra (Sharma was not present) spoke to Amberish K Diwanji about becoming entrepreneurs and innovators. Are all three of you co-founders from IIT? Kapil: Yes, all three of us are from IIT-Delhi. In fact, we are not just batch mates but also hostel mates. All three of us were in the same hostel, same batch. Pradeep: We are from the 1999 batch. The trend among IITians is to go abroad or go to a management course? How come you guys chose a different path? Pradeep: After I graduated from IIT, I joined TCS (Tata Consultancy Services) in Mumbai. I was there for 16 months. Then I got a job in a US-based firm and was waiting for my visa. While waiting, I came to Delhi and we three just met. It was at this point that we saw something different. As you said, our careers were taking the path most IITians take: either an IIM or a job or course that takes you abroad. But when we met, we decided that we want to do something different. So I chucked going abroad and we set up this firm. But how did this idea come about? Kapil: When I graduated, I joined a start-up that had about 10 people in India and the rest of the team in California. I did it for a year and then joined another Japanese start-up. So the idea of starting our own start-up soon became very appealing. Also, a senior of ours had managed to build up a good value organisation. So we had a lot of inspiration to start our own company, the whole atmosphere was there. But then as IITians, you must have been under tremendous pressure to get a regular job, go abroad, etc. Pradeep: I guess in a way you are playing unfair with your parents also! We did exaggerate what all we could achieve to win over their support, we even had to tell them lies. I mean, for three months none of us drew a salary when we started our own company; and we had left a job where we were earning Rs 50k and now you are jobless, living on credit cards. I hid a lot of things, I had to hide facts from my family. Kapil: Definitely, there was a lot of pressure from the family. We used to work entire nights but all the while hiding things. And the pressure was worse because all three of us are from very middle class families. How did you cope with that pressure? Pradeep: It was a difficult. I used to come back from office and continue working from my house. It is so ironic but when I was young, my parents would say you are playing too much and not studying enough, so now go and study. So even when I used to be playing, I'd keep an open book to pretend that I am studying. But after we started our own company, the pressure was so hard, that we used to work all the time. So now, when my parents came to my room, I'd open a computer game to pretend that I was not working (laughs). So finally when you succeed, how does it feel? Kapil: We feel on the top of the world. You admire yourself for what has been achieved. It is the best that you can do and it is wonderful. It is not the revenue you earn or the value that you have attracted but the fact that you have created something that is sustaining itself, sustaining a team of 40 people. The way we planned, the way we did it, the risks we took. Now we feel we can do anything, achieve anything. Pradeep: It is a dream of doing something different that made us start this company, and when it does well, it just feels amazing. Yet, when you started, you must have needed some money. How did you manage that seed capital? Pradeep: When we started, we had a combined bank balance of Rs 50,000. That was the starting money. Then in three months, we took roughly $5,000 from friends and batch mates who were either working or studying abroad. Why did they lend to you? Because they knew you or they trusted you? Or did they like whatever business plan or idea you had? Pradeep: I guess they trusted us and also because they were our friends. At that time, even we were not sure of what we'd do but we were sure that we would do something. Kapil: Money was not the real criterion. We were sure we were going to raise the money somehow or the other. We spoke to our friends in IIT and they knew we were chasing a dream and that they would help us. In all the trouble you had raising money and the travails you faced, did you ever feel like chucking it all up? What kept you going? Pradeep: One was the bond between all of us. There was also the future. We had a dream, but we knew we were going to achieve it. But the bond between us helped. Whenever one of us was depressed, the other two raised our spirits; when two of us were down, the remaining person raised our spirits. Kapil: Of all the companies I have seen, I haven't seen a partnership of our kind. People keep talking of differences between partners but the way we have organised ourselves, we have meetings every week, we share our values with each other, including family issues so that our bond doesn't weaken. In starting a company, what comes first: the company or the idea? And how does it progress? Kapil: I don't think we really had any major idea but we were clear that whatever we do, it would be IT related. When we started our company, we tried a service-based model and for every service we made, and for every service we tried to make a product to improve the service but which was rejected. But in the process, we kept improving the products we were making, and finally after four, five months, we decided to market a particular product to earn us extra revenue and this product became our main bread earner! Pradeep: When we started, we knew nothing about what we'd do, but we were sure that we'll do something. We dreamt that in the next year or so, we'll be Infosys and had those kinds of fancy plans. And in three months, when we were really frustrated, we started with a small product, which has earned us $100,000 in three years. That was the beginning. The first product took us 28 days to sell; the next product took us nine days, and that was how we soon became motivated. Our breakthroughs took us forward. By the way, what are your fields of study? Pradeep: I am from textiles, Kapil is from chemicals, and Purvesh is from computer science. So from among you, when you stared, only Purvesh was clued in about computers and IT? Do you see more IITians becoming entrepreneurs? Pradeep: Yes, the idea is much more predominant now. Kapil: I have found that just from my batch, roughly five or six enterprises have started. That is teams of five or six. Then, there are a number of juniors who want to also emulate us. The trend has begun and people believe that you can go forward, that success is now possible. It covered the spirit of the team and was inspiring enough. I feel motivated.